Terrific savings! 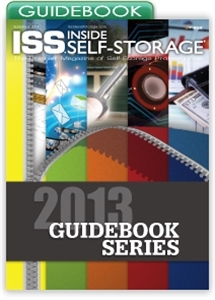 The Inside Self-Storage 2013 Guidebook Series conveniently contains all five digital Guidebooks at a 25 percent discount. Get detailed insight on ownership, marketing, management and more. Building/Investing Guidebook 2013 - Designed for those who want to invest in self-storage or who are serious about establishing or expanding an operation. Covers real estate, finance, development and construction. Facility-Management Guidebook 2013 - Helps to define the duties of a self-storage manager and provides insight to several key job areas including sales, service, money management, maintenance, legal risks and more. Marketing Guidebook 2013 - Provides a substantial overview of the marketing techniques available to self-storage operators and insight to help you determine which strategies might work best for your particular business. Ownership Guidebook 2013 - Provides guidance to help single- and multi-facility owners take control of and maximize their investment, covering everything from money management to liability and much more. Technology Guidebook 2013 - Helps you understand the technology available for your self-storage business, how to leverage it to your advantage, and common pitfalls to avoid.